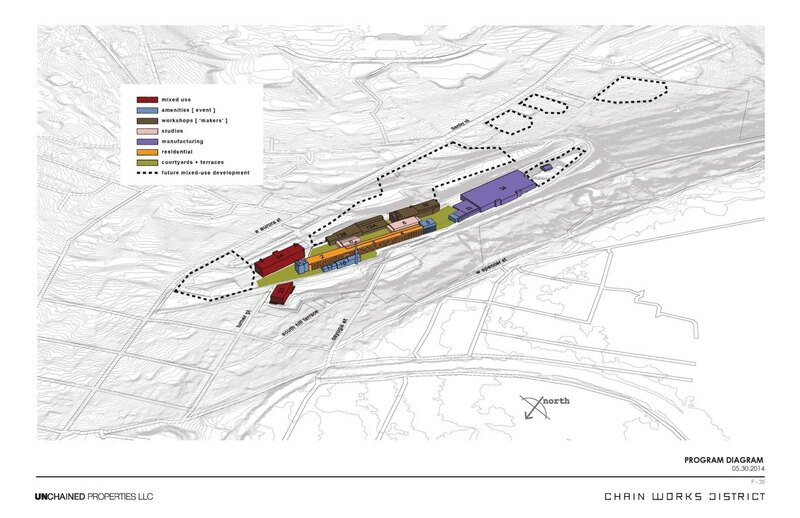 Unchained Properties and the project team for the 95-acre Chain Works District (former Emerson site) held a second public meeting today (August 5th), primarily to discuss their approach to zoning and to give more information on proposed site layout. Mayor Myrick began the meeting by noting that the community involvement this early-on in a project bodes well for its development, and that the local economy is seeing some of the best numbers statewide as far as unemployment, job growth, and housing creation, so this project will inevitably become a major part of the change we should continue to see in the City. 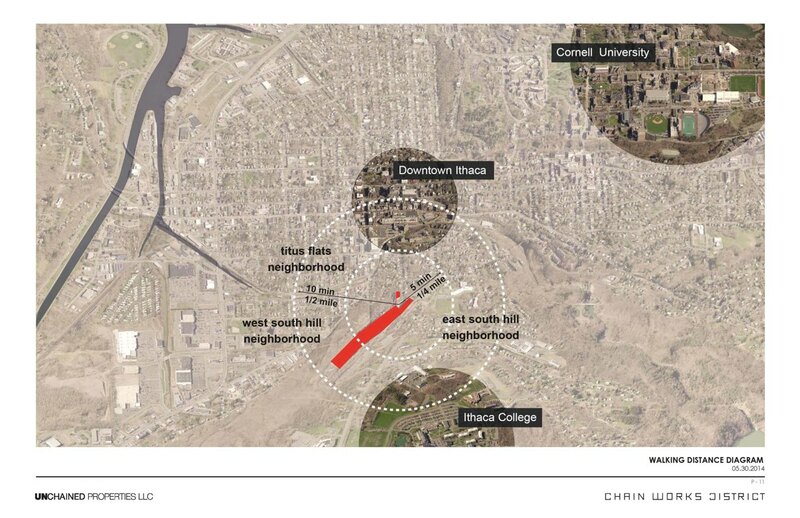 Myrick and the project team explained the reasoning behind the developer’s decision to seek a Planned Development Zone (PDZ) in the Town of Ithaca, and a Planned Unit Development (PUD) in the City of Ithaca, since the parcel is split between City and Town. The PDZ and PUD are essentially the same thing: it’s a form of zoning and regulatory process that can be approved by the municipality in order to allow a project to develop outside of the current zoning on a parcel or set of parcels. Scott Whitham of Whitham Planning and Design observed that since the current zoning for the Emerson parcel is Industrial, it would not be applicable or realistic to a large mixed-use redevelopment, as is being proposed, so the project team is submitting zoning materials to both the City and Town to consider in their PDZ and PUD processes, which carry the same requirements as a rezoning of any other area: the community has input and commentary in public meetings throughout the process, and the rezoning would fall under the requirements of the New York State Environmental Quality Review Act (SEQR), and review from the Tompkins County Planning Board. Once the zoning portion is complete, then the project team may submit Site Plan Review applications to the corresponding Planning Boards. Craig Jensen of Chaintreuil | Jensen | Stark Architects summarized some items from the previous presentation: several buildings would likely be demolished to create open spaces between mixed-uses, and the design team is studying similar projects that have incorporated adaptive reuse practices on former industrial sites. The 1/2 mile distance to downtown (closer than Collegetown) will make non-automotive transportation options an attractive prospect. 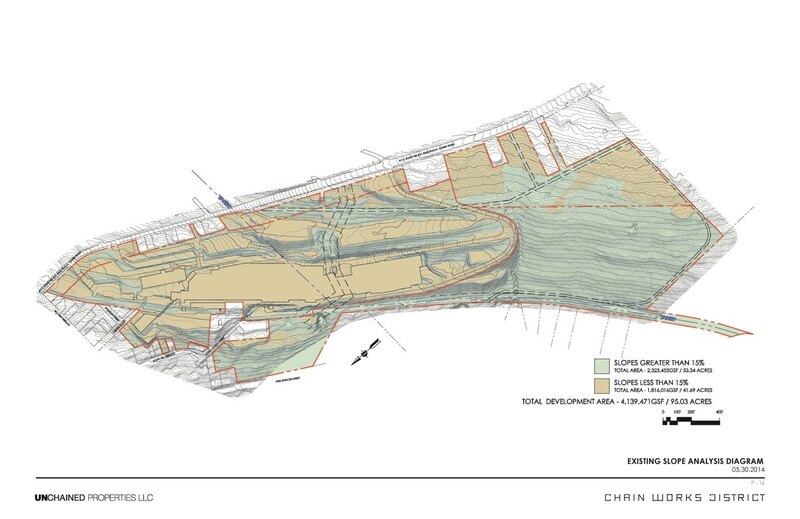 In addition to working on the zoning proposal for this site, Noah Demarest of Stream Collaborative is working on combining the two Town and City Zoning Codes to conform with the Town Zoning & Comprehensive Plan and the forthcoming City of Ithaca Comprehensive Plan. 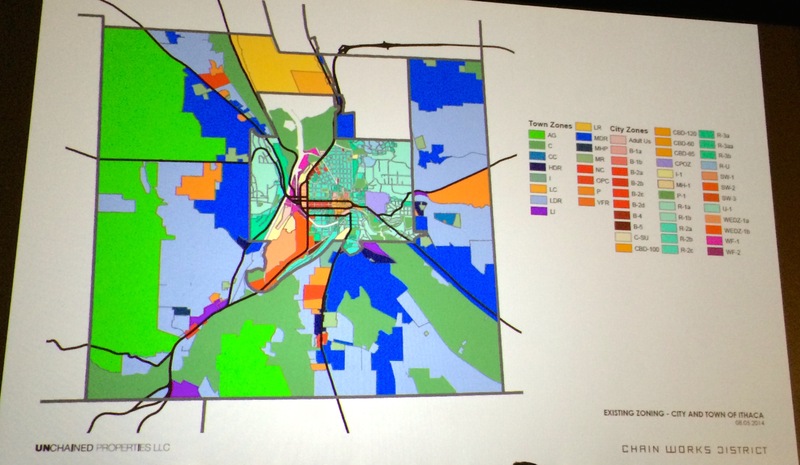 The combination would be adapted into a Form-Based Zoning Code, with Transect Zones rather than the existing zones and codes we have today, which can be over-complicated and use-based, and contain more amended content than original content. 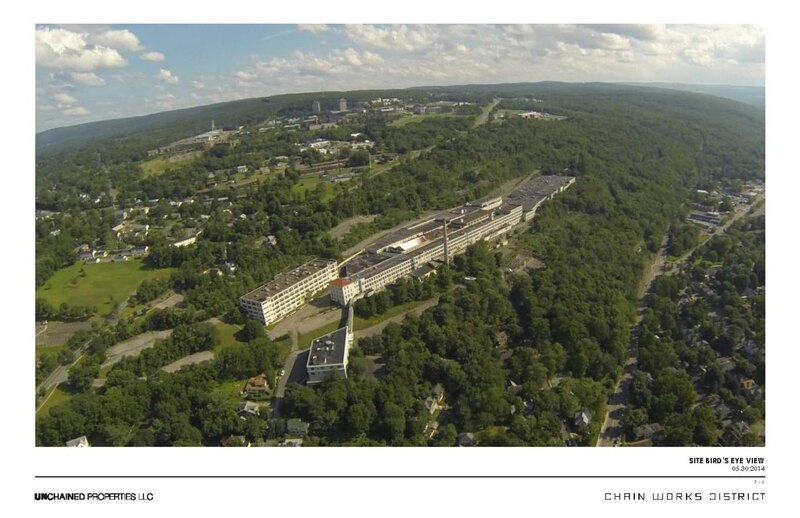 Transect and Form-based zoning seeks to establish allowable building massing as a priority over accepted uses, and emphasizes a logical transition from rural areas to urban centers, mimicking the transitions found in natural geography. More information is available from the Form-Based Codes Institute and the Center for Applied Transect Studies (which was founded by Andrés Duany and Elizabeth Plater-Zyberk, who wrote the first form-based code for the town of Seaside, Florida). The zoning code suggested here is adapted from SmartCode template, which is a Transect-based subset of form-based codes. Transect-Based Zones are as follows: T1 (Natural) included in project, T2 (Rural) not included, T3 (Neighborhood Edge Zone) not included, T4 (Neighborhood General Zone) included in project, T5 (Neighborhood Center Zone) included in project, T6 (Central Business District Zone) not included. 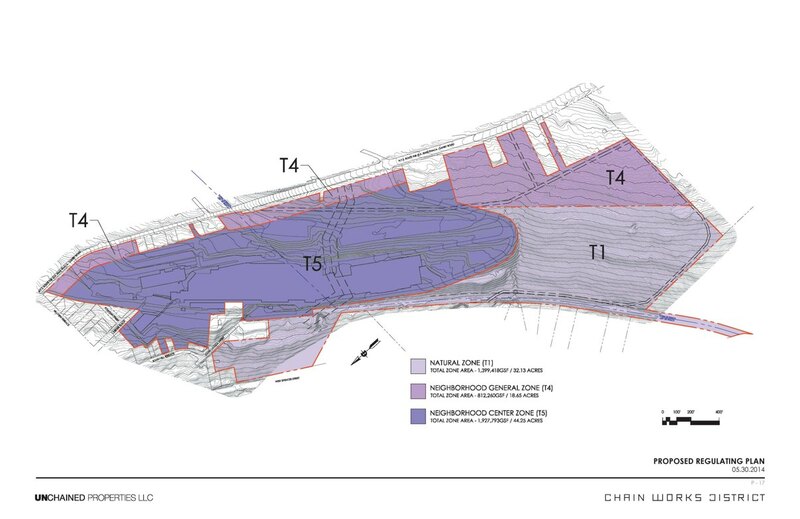 The existing topography affects these zone decisions: a 15% or greater slope is not realistically developable, so there are several areas, especially towards the south end of the site that would not be developed. The question and answer session brought-up traffic concerns on surrounding streets. The Project Team has employed Steve Ferranti of SRF Associates to study the current and historic traffic and transportation patterns, along with trip generation estimates based on the proposal as part of the SEQR process. The team noted that mixed-use projects generally have different peak patterns than single-use, which should help with congestion. 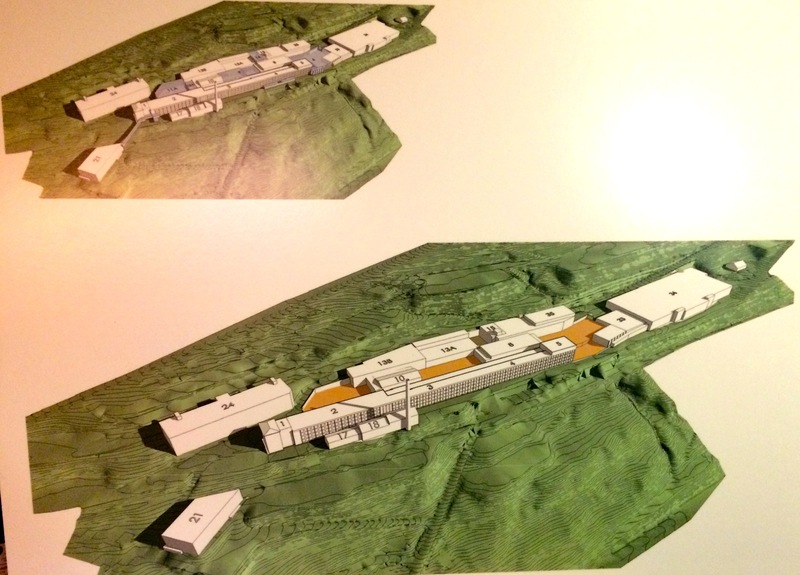 Concerns about environmental remediation and removal needs surfaced, which will be studied in detail by the team’s environmental consultant LaBella Associates throughout the same SEQR process, in both rezoning and site plan review. The response from the public was again, quite positive overall.